Grad students await the start of the MSN/DNP Winter Awards at Glenn Memorial Auditorium. The Nell Hodgson Woodruff School of Nursing honored its graduate students completing degrees in December 2017 or May 2018 during the school’s Graduate Winter Awards Ceremony Monday, December 11th. Hundreds of families, friends, and alumni were present to celebrate the accomplishments of the school’s graduate students. The graduating class included seven DNP students – the second group of students to graduate from this program. In addition, the school recognized 108 MSN students, and five post-graduate certificate students. Graduates include those from China, Jamaica, and Nigeria. 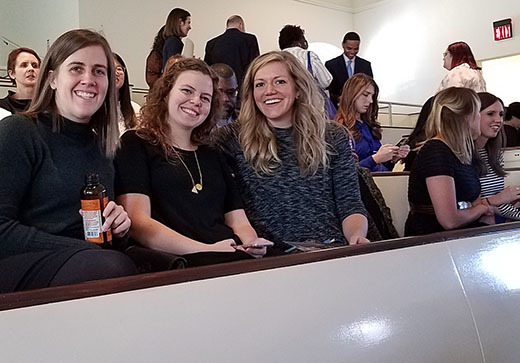 In collaboration with the Emory Nurses’ Alumni Association, the School of Nursing also paid tribute to three outstanding students with the distribution of the Silver Bowl Award, the highest student honor. DNP student Leslie Jeter and MSN student Kate Dirks received this year’s Silver Bowl Awards for demonstrating exceptional clinical and scholastic abilities while also serving as inspiration for other students. Student-nominated awards were also given to two faculty members on behalf of the Emory Student Nurses Association. These awards, known as the “Heart of the Students” awards, are given each year to faculty members who go above and beyond in their teaching and mentoring. This year’s “Heart of the Students” awards were presented to graduate faculty members Corrine Abraham, DNP, RN and Molly Bachtel, DNP, RN.